Our Families photo: aka ‘Elevator Pitch’ photo, as featured on the Our Families page. Main profile photo: This is the larger one, featured on your main profile page with your intro letter. We consider this to be the most important photo on the site. This is the first photo all our site visitors will see on the Our Families page. This is the one that will potentially get you clicks and drive traffic to your page. If you are a Starter family, your pitch photo is created automatically for you, pulled from your profile. Unfortunately you don’t have any control over its appearance. If you are a Featured or Premium family, things get more interesting. When you sign up, Adoptimist staff will help you choose and optimize your Elevator Pitch photo and place it on the site for you. If you follow your adoption profile statistics closely and find that your profile is underperforming, you may want to eventually consider changing this photo for another in your collection. A new lead photo can give your family a different look and potentially bring you more clicks. But be careful. A new photo can have the opposite effect as well. So don’t go swapping photos just because you feel like it. Contact Adoptimist staff for details on how and when to update your Elevator Pitch photo. We offer complimentary photo review and optimization services for Featured and Premium families. Your main photo will look best at 350 pixels in width. The image height is variable and therefore more flexible. 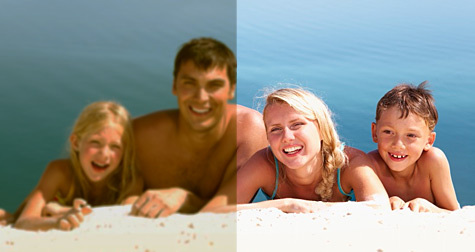 If you have photo-editing abilities, you can optimize your original image precisely to fit these dimensions. If you do not, the Adoptimist system will resize the photo for you automatically. However, it may end up looking stretched or blurry. In general, landscape images (horizontal) will look better than portrait (vertical). If you have the know how, consider cropping your photo to achieve a closeup or remove unnecessary or distracting content. A few more points to consider: Closeups work better than distant shots. If you like a photo but the image quality is poor, consider finding another or simply walking outside and snapping a brand-new image. These days it is easy to take a quality photo. So don’t settle for something that looks bad. You don’t need professional photos. You need good photos that reveal something authentic about your family. Image quality is just as important. So is good lighting. No scans. No sunglasses. Does your main photo accurately reflect who you are as a family? An adoption connection is about many factors. But on Adoptimist, good photos are the first step. Don’t let poor photos (quality or content) hurt your chances of connecting or becoming an Adoptimist adoption success story. Take advantage of every opportunity in your profile to visually represent your life, hobbies, and individuality. If you are a Featured or Premium family, our staff is ready and waiting to work with you. We’ll provide expert advice and complimentary photo work to get your profile on track. Get in touch with us to set up a free photo review and consultation.